Elizabeth :-) on A LITTLE PRIVACY PLEASE! Sharon Combes-Farr on Vive La Différence! Bruce Farr on What’s It Like? Graham Parker on What’s It Like? Thus far, the “Vermont Inn-trigue” thread of my blog has mainly contained stories that revolve around my mother, Ruth Combes. She is precisely one half of the dynamic duo of innkeepers that have kept this business going for more than 36 years. I am overdue in writing specifically about the other half, my father, Bill Combes. 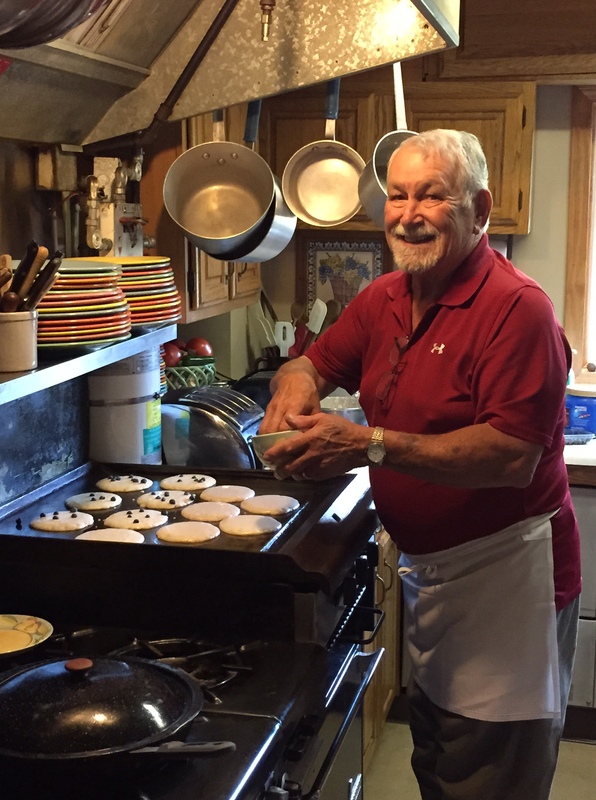 Since the beginning of this long adventure, Dad has been the inn’s handy man, head purchaser, waste manager, and, most famously, breakfast chef. It’s for this last role that he is beloved by guests, and it’s the sole subject of this post. 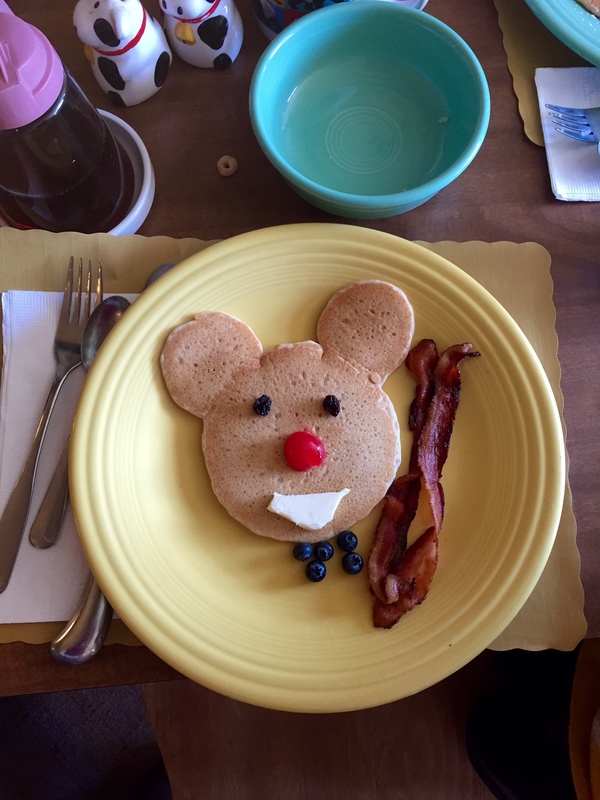 Also of note is the fact that my mother is not a morning person, so my father’s contribution as the breakfast chef is fundamental to inn guests getting the second B in B&B. Given the amount of rich material on the topic, it will certainly lead to at least two additional blog posts. You wouldn’t know it this morning. First of all, today is Sunday, signaling that, as tradition dictates, pancakes are on the menu. On other days of the week, various breakfast meats in combination with eggs, and sometimes French toast, appear on the breakfast menu. But every single Sunday morning it’s pancakes and sausage. 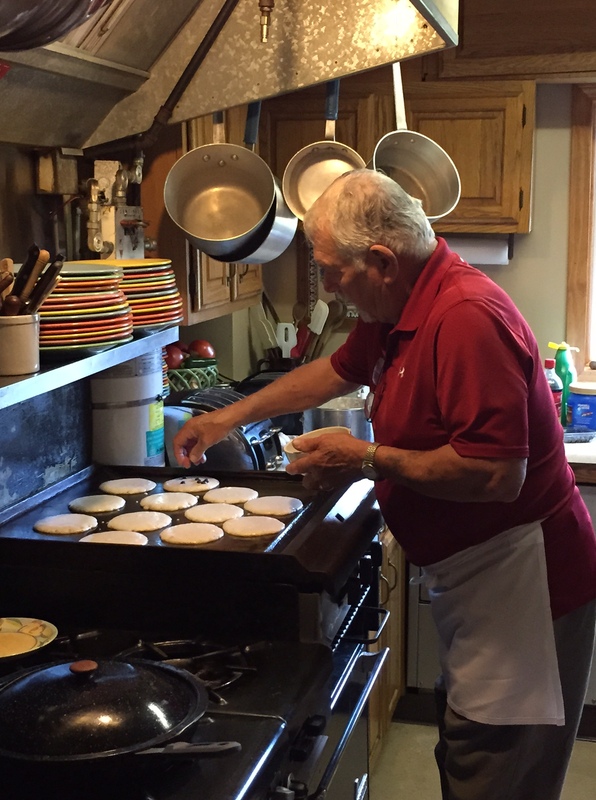 And Dad’s pancakes are as legendary as they are delicious. One box of Jiffy Corn Muffin Mix. 8 cups of your favorite Buttermilk Complete Pancake Mix (Dad prefers Krusteaz, although any brand will do). 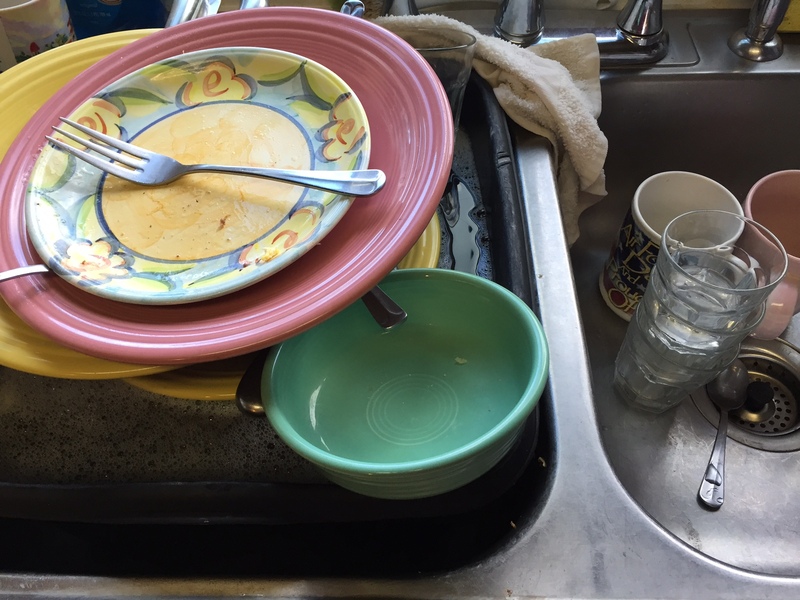 Approximately 7 cups of water (see “method” below for more information). Yield: 20 or more servings of 3 medium-sized pancakes. Use an electric mixer to beat together all ingredients. When adding the water, make sure to pay attention to the texture of your pancake batter to get the right amount of water. “You want the batter to run off the spoon, with a little imprint left on it. 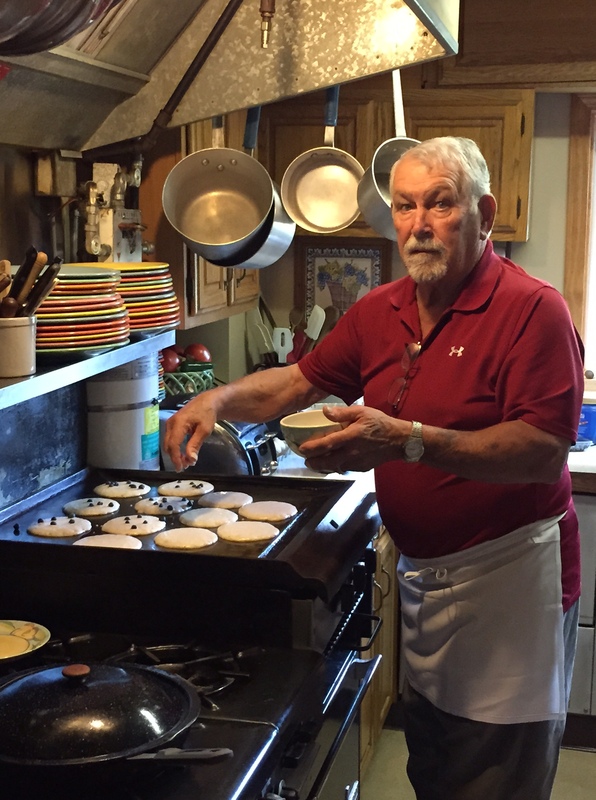 The batter should not be resistant to come off the spoon, nor should it be runny,” Dad explains. Your griddle has to be hot, but not too hot so that you avoid burning the pancakes. To grease the surface of the griddle, use a good quality margarine, not fluffy tub of margarine or butter. Regardless what others say about using real butter, Dad’s experience is that margarine is not only less expensive than real butter, it also melts more easily and doesn’t burn as readily. Do not try to flip the pancakes, until after the air bubbles that form on the surface of the pancake has burst. “You will be tempted to flip them before the bubbles burst. But do not do it,” Dad warns. Dad’s advice about prepping and greasing the grill is universal, whatever’s on the breakfast menu. I personally don’t often eat pancakes anymore. Seeing dad was in a good mood today and I didn’t want to push it with an outlandish breakfast order (something I usually do), I requested scrambled eggs. His scrambled eggs are among the fluffiest I’ve ever had and I have to admit I have not been able to replicate his method myself. I asked him to walk me through his method for achieving fluffy and perfect scrambled eggs, so I could explain it to all of you. Add tablespoon of water and beat the eggs very quickly to capture air. Since you are working with a hot grill, the other secret is to spread the eggs with a fork all over the griddle and cook them for less than one minute. Scrambled eggs cook much more quickly than any other style, so keep that in mind if you have a mixed order from the same table, the eggs aren’t on the griddle for more than a minute. It was a real treat to find Dad in such a cooperative and chatty mood this morning so that I could quiz him about so many of breakfast secrets. He even revealed that he has been experimenting with his scrambled egg methodology and looked up Martha Stewart’s techniques on his iPad. If you have the luxury of only having scrambled eggs on the menu so that you don’t have to keep your griddle very hot, he suggests that you try Martha’s low-temperature method. Two videos of this method are available here and here. Speaking of the appropriate timing of the different components that go into an egg dish at breakfast, my dad’s number one advice about cooking breakfast is something that I learned in high school and have lived by ever since. With the one exception of poached eggs (as you just learned above), “you always put the toast down first, before putting the eggs on the grill – always,” my father advises, even warns. We’ve come to the end of this blog post and I haven’t had a chance to explain why we call him the “Vermudgeon.” For that, you’ll have to tune in next week.